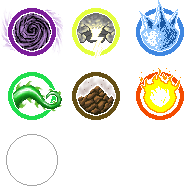 as i couldn't find elemental symbols that worked with the UI, i had to come up with a way to display collected elements in a little html game i got hired to program. elements are 64x64 and the sheet includes the ring in which the elements are framed. it really is a missing link! therefore submitting for 2018 summer OGA challenge. if you can make it better-looking, please, halp. these are great! I know you said something about struggling with an idea for 'rock' but I think that one came out great! The only other idea I can think of it for it would be a mountain peak, but I think what you have does a better idea of conveying 'rock'. Mountain peak would be more 'earth'.